On a recent gorgeous day, we were surrounded by verdant lawns, and standing amid rows and rows of gravestones. This land of ended life was still, as if time had stopped. We were visitors to the silence. Among them all, those blessed dead, the body of a father lay in rest. Behind me stood his wife and their son, and with them, my husband. Memories of my own father’s all too early death, and of our own daughter’s more recent one, soon came to mind. Standing there, surrounded by the living and among the dead, I found myself in wonder at the miracle of life which faithful married love brings onto earth. There was more love in these three now ended lives than love itself can bear — and in the tears, a strange, veiled joy. Before me, behind me, and in that consecrated earth beneath me, lay the meaning of ‘until death do us part’. What becomes of all this faithful love when the parting hour comes? Does it also die? It is an interesting, and perhaps even a strange proposition to promise another fidelity until death. Very few human commitments require this totality. Marriage happens to be one of these. Standing at the altar, our promise, and that of our parents, and the countless generations of men and women before them, had a beginning, a middle, and an end. It was and remains a total consecration to another, before God, to be carried out to its completion — to the point of total love — the point of death itself. It is easy to disregard this dramatic end-point in the vows. After all, rarely do we walk up to the altar on our wedding day pondering the end point of our lives. Naturally, marriage is the beginning of a new union, celebrated at its birth with special joy. But this union simply begins at the altar; it is not brought to completion there. Only death brings the union to perfection. The finality of death is such that the earthly work of union can no longer thereafter take place. Fundamentally, union is completed in this final separation. Everything between is purification; a growth of love, a falling and a rising, like the flickering flame and the precious wax consumed beneath it. The paradox is that the human heart is opposed to separation, it revolts if it is filled with love. Every parting is a sorrow, a wounding severance and piercing pain. Some partings are temporary, others, irreversibly final. Death is a final parting, and it is never easy. Death is a confrontation that leaves us physically alone; although many may surround us, in itself, death is a solitary road, both for the one who dies and the ones who remain to live. Here, in this solitude, sorrow abounds, and we are pilgrims in the vale of tears. In death we are forced to contemplate the temporal in light of the eternal. No longer is it enough to work out this love project together. The familiarity of death introduces the possibility that what we do here and now is oriented to the everlasting, and so requires an appeal to the eternal. Marital love is no exception, and precisely because of this, the vows give the marital love project a clear beginning, multiple middle points, and a specific end. 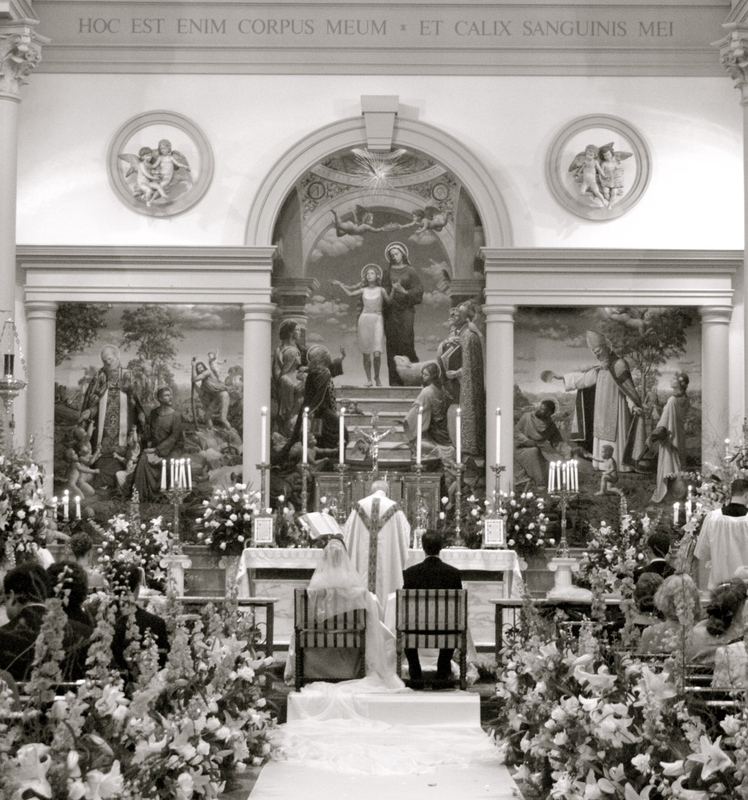 The consecration to another before Christ at the altar is not an accident of convention. And it is at the altar that it also ceases to be strange. Beyond the surface is an act of mutual conformation, and a confession of need. Love staked on human strength is bound to weaken in human frailty. Only elevated, consecrated, can it survive the beating winds of hopeless discontent. At the end, its only hope is redemption, and mercy, and boundless gift of self, and nourishment in grace. As two human lives join in union, they are given access to the fruitfulness of a deeply spiritual and physical love. As they part ways in death, that separation generates a different union — a communion of souls is born which transcends the limits of human frailty and bears one’s gaze to the heights, where an eternal love abounds. Interestingly, that graveyard held this lesson preciously buried beneath a sunlit sky. We are asked to part from those we love the most, children, spouses, parents, so that we learn to love more fully — totally. Standing there, it was as if before an altar — memories of loves now completed, and pray, rewarded, to sustain yet living ones. For the reality of the finitude in death is not acceptable in love. Love begets love even when the body lives no more. The soul will not die. And there is joy in this, amid the many, many tears. Many deaths are lived in marriage before a final dying. Union is inherently the death of self to generate oneness. Oneness usually begets life, but in some cases this fruitfulness of love remains desired and unknown. Hope in love itself sometimes dies. The body often comes to know a slow death in illness, and pain, and age. Time sometimes brings about the death of enthusiasm. A love that is not joyful becomes difficult. In the difficulty of loving, the seeds of sacrifice are sown. Great offerings are often called for. And the cycle begins anew, for union is the fruit of a total love, and such love demands all things. There is a model for this love, and it is Incarnate. Marriage is a conformation of united lives to this model — an offering of everything that takes as its precedent the totality of the Love that died for love. The difference is that God does not take offerings as we do; the meager offering given Him is expanded far beyond the limits of its finitude, and from this miracles are born. Life and greater love emerges in the privation of death. What we no longer have in parting we love yet more. Strangely, death is fruitful. The story of every married love is an endless cycle of dying and newly living. Offering begets fruitfulness; sacrificial love, oneness; sterility, bountiful generation; union, joy; death, life of the soul and purified love. Nothing is wasted, nothing lost, for even the ashen wood begets warmth, and heat; the flame consumes, destroys, and so gives light. And it is so that in the darkest times, in death and dying and parting, in sorrow and loss and absence and distance, in the death of joy, in the relentless agony and monotony of pain, amid the tears, that hope rises from the ashes and gladness flickers again. Like those water jugs at Cana, when the water died and became a crimson wine — death is such sweet sorrow. Is this perhaps why we meditate on the finality of union at its beginning? Could it be because death is never the end of love? At the end of the vows is the reason why we make them to begin with — because ‘this day forward’ continues after in death we part. Be this marriage done! And may the parting be a blessed one, as the living, joyful, and the final union, divine. This post is preceded by From This Day Forward and For Better, For Worse.